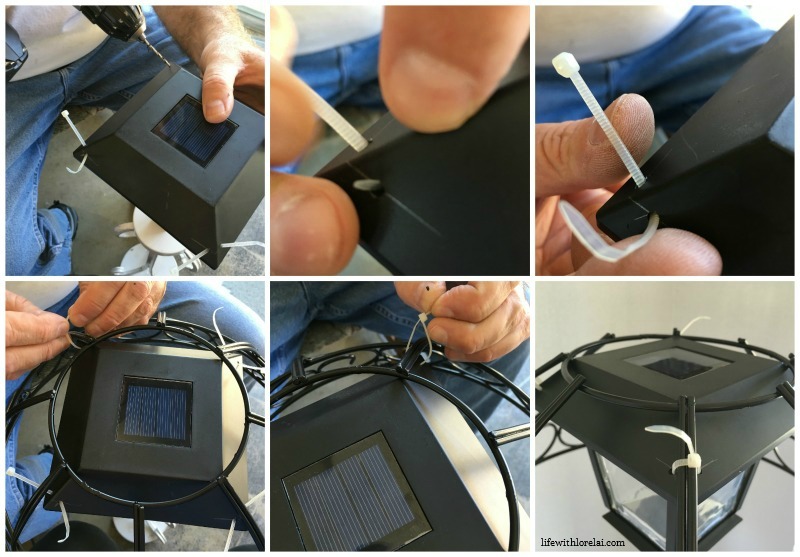 Make your summer nights beautiful by creating your own outdoor ambiance with this Solar Lamp DIY project. 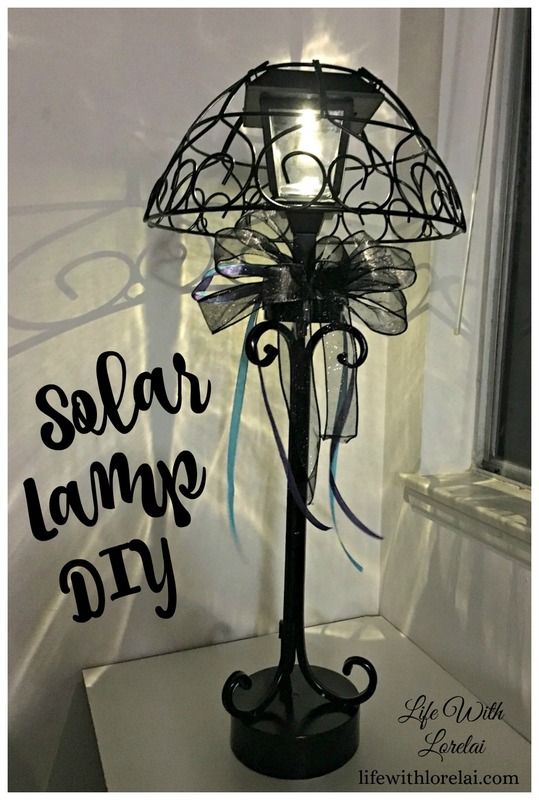 I have been wanting to make a solar lamp for our backyard patio area for a long time. So, I kept an eye out for the perfect base to accomplish my goal. Luke and I stumbled upon a tall candlestick with a concrete base that we thought would work perfectly. Since this lamp is tall and will be outside (where you may get a breeze), we needed a heavy base to support the lamp. We found our base on clearance at one of our favorite craft and hobby stores. 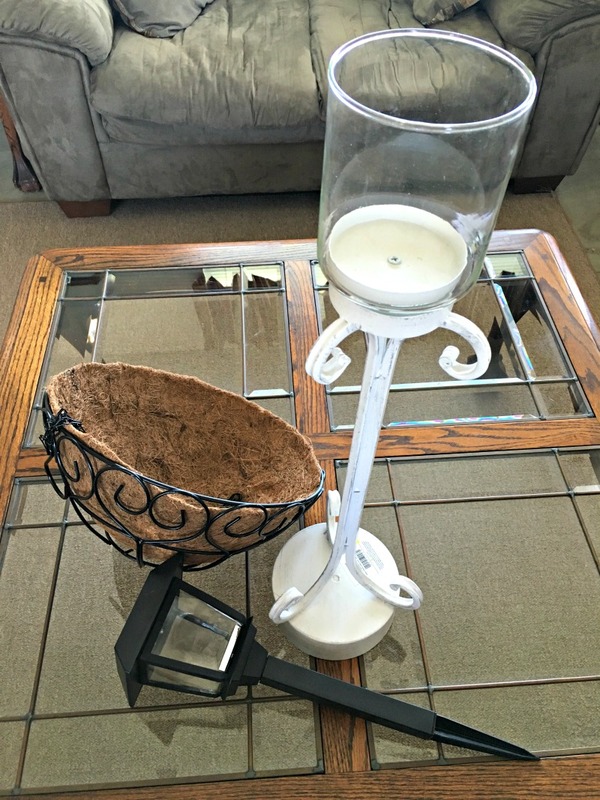 You could also find a heavy candlestick or lamp base at a thrift store or garage sale. 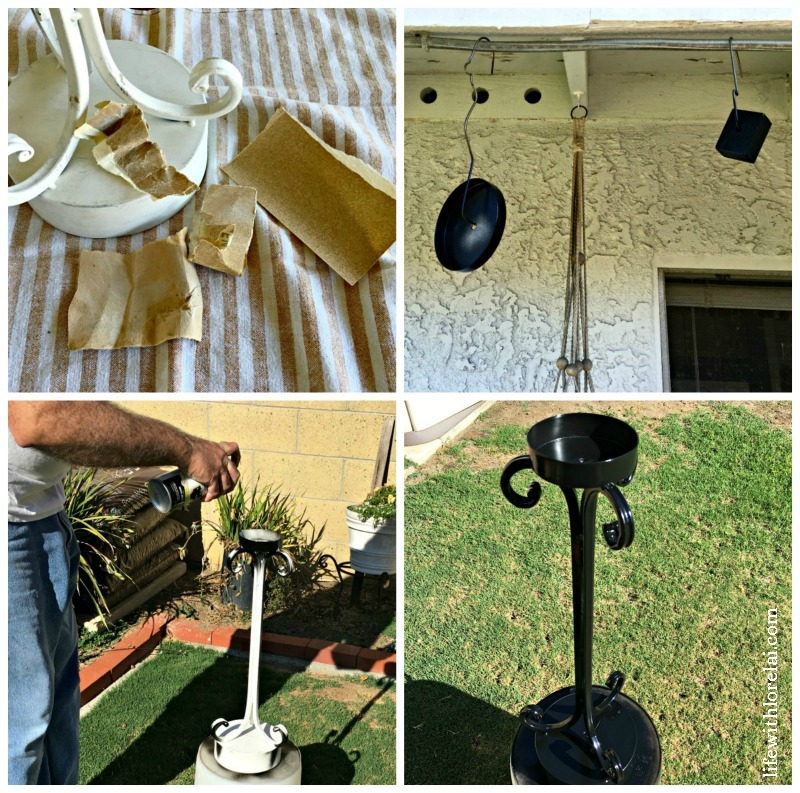 We picked up a hanging plant basket, a solar yard lamp, and a long screw with a washer to complete our project needs list. 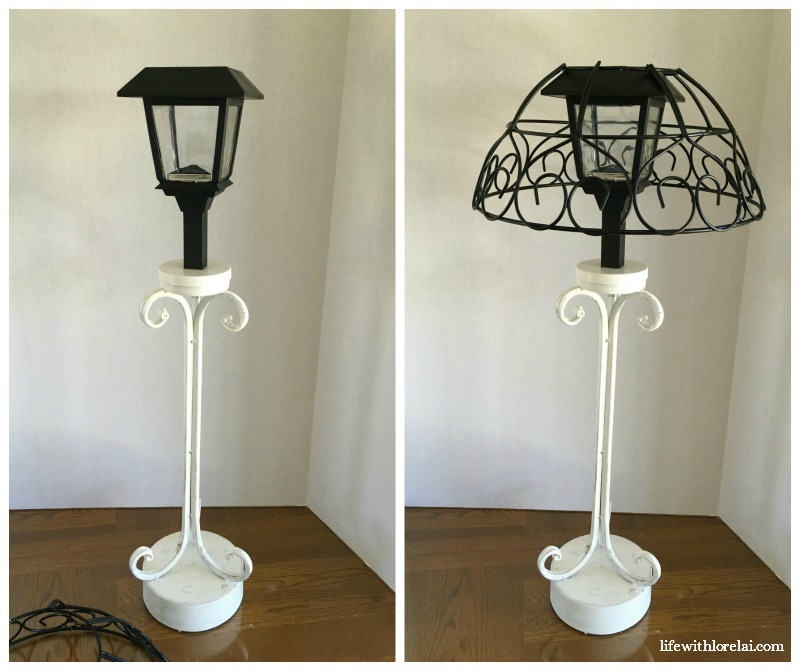 Choose a yard lamp and planter basket that fit the proportions of your base stand. We already had a can of black spray paint, some fine-to-medium sandpaper, and a couple pieces of scrap wood. You will also need zip ties, a pair of vice grips, saw, miter box, and a drill. The first step in our project was to assess our components and come up with a plan that would work the best to provide stability and durability. 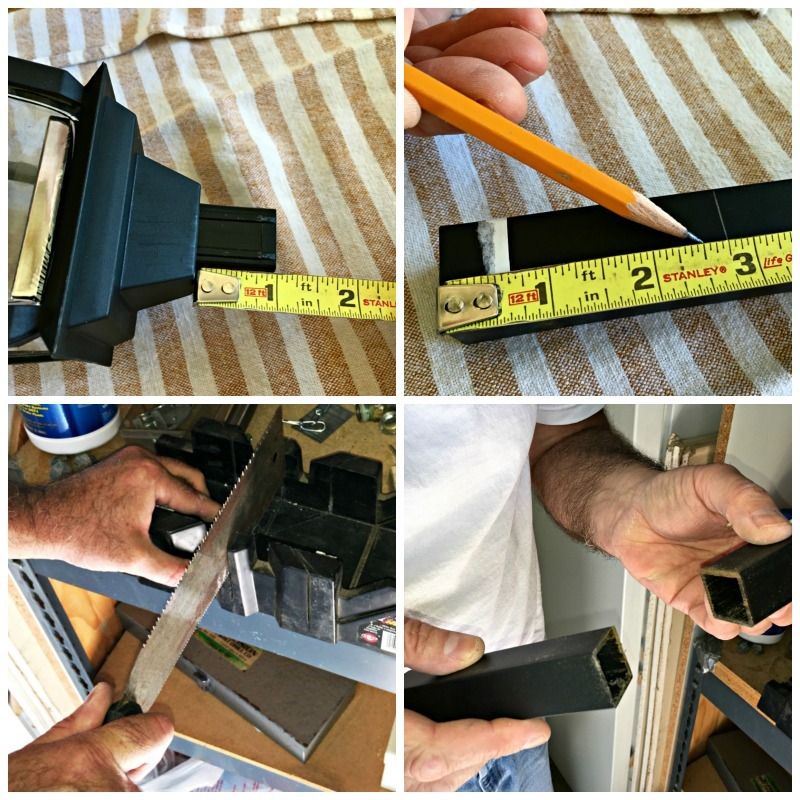 Make sure you measure everything, so you can be sure to have the proper length screw(s), etc. for your project. Having a solid plan helps the work go together faster. We removed the glass candle holder (I used that for something else later). As you can see in the first photo, our glass candleholder sat down inside a metal dish attached to our stand. A second metal piece inside the glass allowed for a screw to hold the glass to the stand. This second piece turned over and fit perfectly over the first piece. We made a wood block to fill the space to give strength and stability to support our yard lamp and planter basket. We marked it with an “X” to find the center for drilling a hole for the screw. 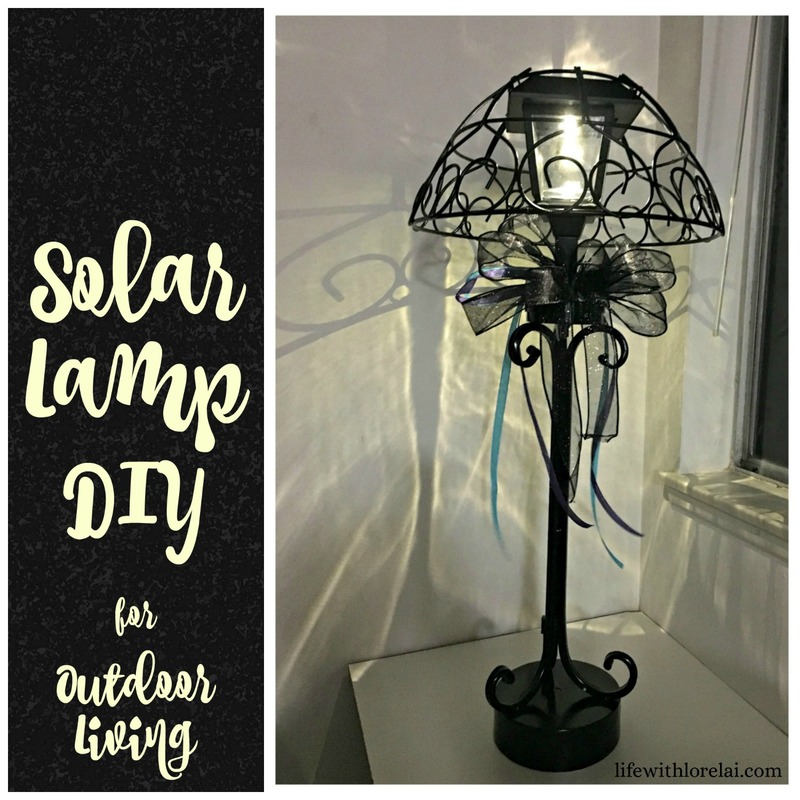 Take the stem off your solar yard lamp. Measure the stub on the lamp that the stem fits over. Then, decide how tall you want your lamp to be with the planter basket shade on it. Once you have the proper height, measure and cut the stem. We used a saw and miter box. Now, you want to find a scrap of wood that you can cut (and file if needed) to fit snugly inside the stem. This will add strength to your stem to support the weight of the lamp head and planter basket. You want to cut this wood to a length where your screw will go from the top of the wood and screw into the base of your lamp. This screw is what holds the lamp together. Make sure there is plenty of room for the screw head and lamp stub to fit easily into the stem. Drill a hole all the way through the scrap wood (length-wise). Then, shove the wood scrap inside the stem, it should be tight. It is always important to test fit any project. Get the bugs out, and make any tweaks and adjustments that are needed, before you put on the final paint and polish. Start by making sure your base is ready to add the solar lamp. For us, that meant having the wood block in place inside the metal dish. Then, take the screw, with the washer, and place it through the solar lamp stem. Tighten the screw, attaching it to the base. Notice the wood does not fill the entire stem, so there is room for the screw head and the lamp stub. Place the solar lamp stub into the stem. 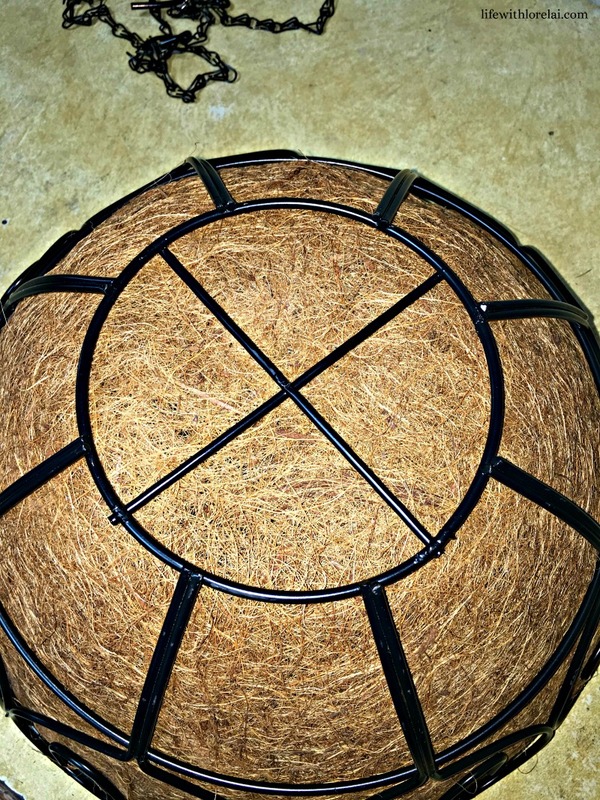 Set planter basket upside down on top of the solar lamp, to create a lampshade. 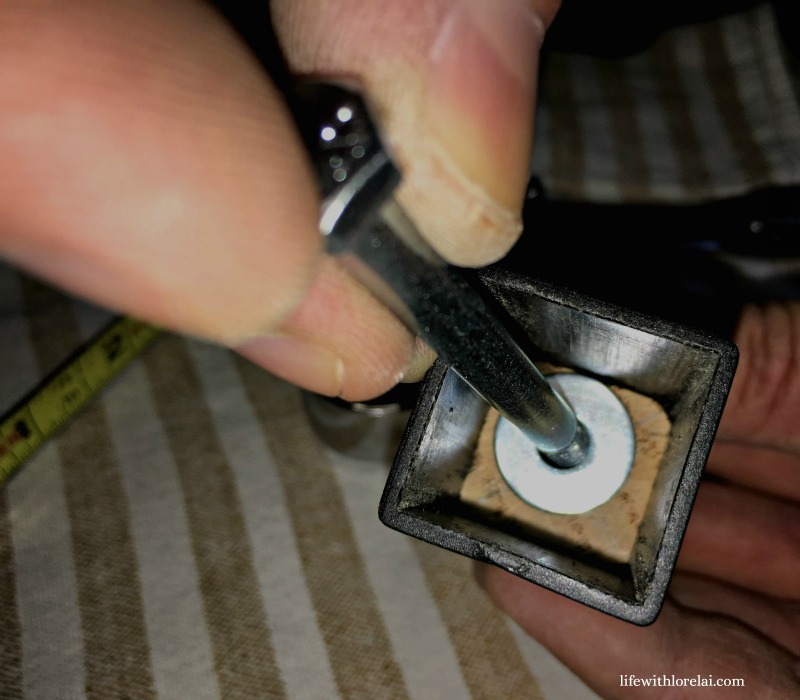 Decide where you will need to drill the lamp cap to place zip ties for attaching the lampshade. Since we did not paint the planter basket, we attached the lamp shade to the solar lamp cap. We had a square cap, so we drilled holes on either side of each corner edge, and threaded the zip ties through. We used white for the pictures for you, so they would be easier to see. Rough-up the base and all pieces that need painting with some fine-to-medium sandpaper, so the paint will stick well. Spray in short, even bursts at a distance of about 12 inches. Make sure everything dries thoroughly before assembling the lamp. You can see that we changed out the white zip ties for black ones for our finished product. I know you will enjoy this solar lamp as much as we do. 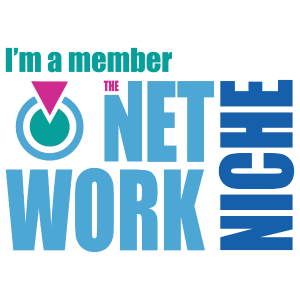 It was a fun project to create, and we are getting lots of use out of it. 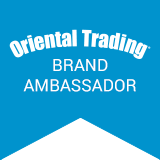 Impress your family and friends! 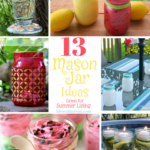 Looking for another fun idea for outdoor entertaining? 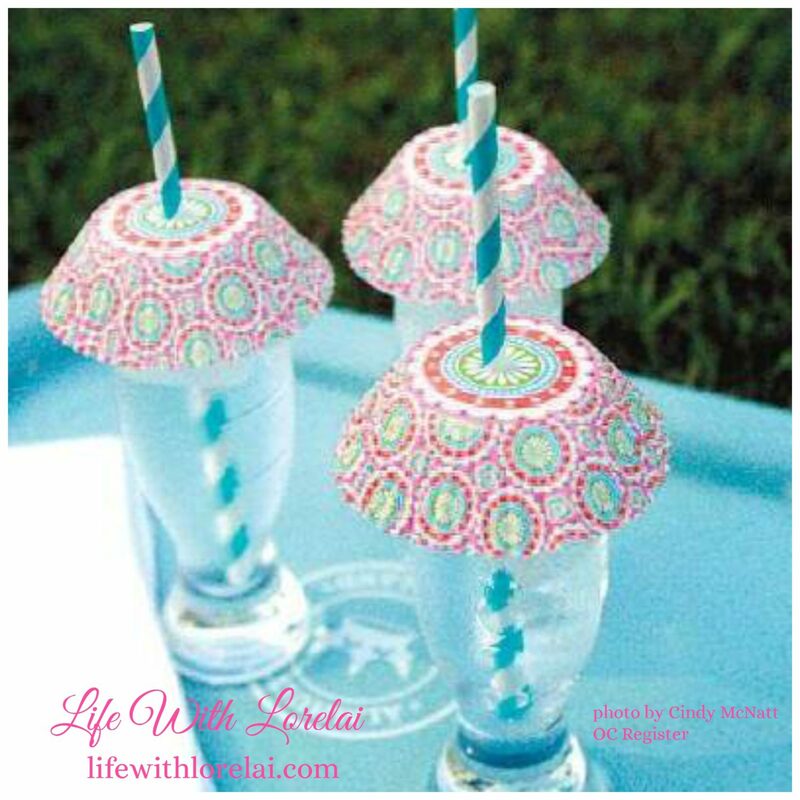 Check out my DIY – Bug Umbrellas For Party Drinks! What a great solar lamp! 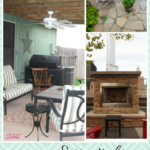 I would love to put one together to use on our deck. Now that it’s getting darker earlier, this would be perfect for nights when we are grilling or just hanging out on the deck. Love it!! Looks like a good lamp to have on a back porch for those late evenings. How great that you found the base on sale. Those things could be pricey. So glad you were able to find one and make the lamp. Really cool project! Very creative. We will have to keep my eye out for a base that would work so we could do a project like this. What a cool lamp. I am so going to make a few of these for our new deck. 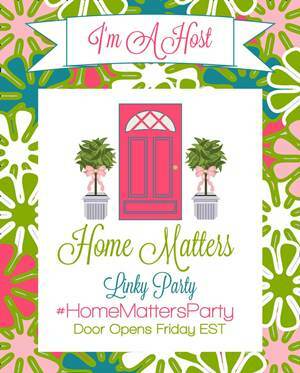 Love hosting #homemattersparty with you. 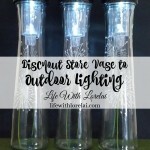 I love solar lights and your outdoor living lamp is just perfect. 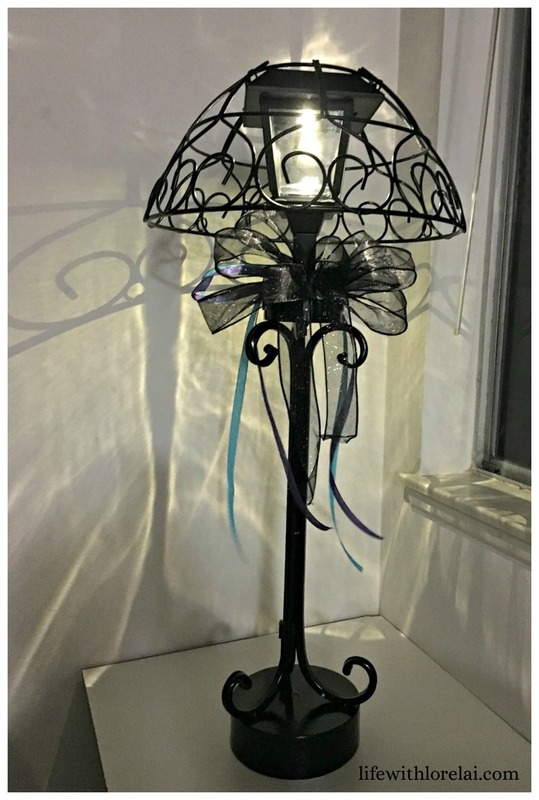 You made such a good creative lamp that will enhance your entertainment area. Bloggers Pit Stop, we just love quality posts. 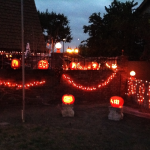 I always love solar lighting projects and this is a nice one! 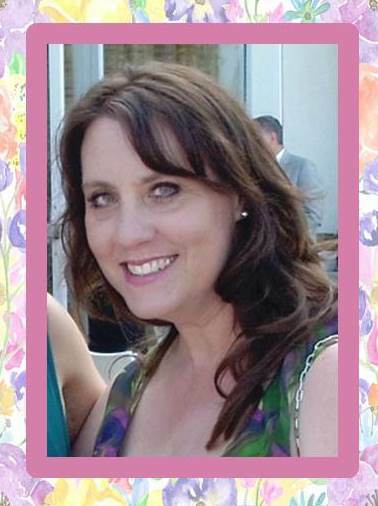 Thanks for sharing with us at Merry Monday. 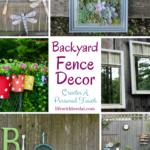 We’re pretty excited about fall and looking forward to seeing lots of fall ideas shared at the next party now that we have made it into September. 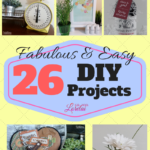 Great projects. I am pinning this idea. I dislike solar lights because they always seem to be misaligned in my neighbour’s yard. Having one or two of these lamps though would add necessary light and be uniform and pretty. Thanks for posting.